I'm off to Spain tomorrow for a week to teach and stay with friends - it will be fun! 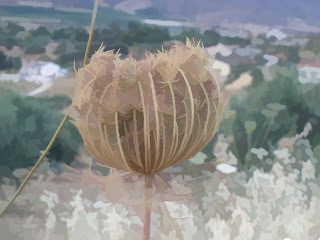 The image above is a photo I took a village north of Malaga - it's a fantastic seed head which I have been playing around with in my design work. 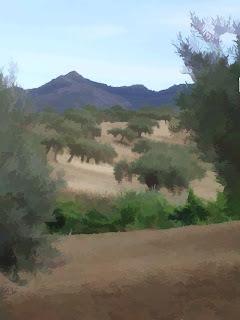 The other image is of an olive grove near by. Both have been manipulated using a design programme. Thanks for your comments on my blog - I enjoy reading them! I've had a very busy summer - too busy to post! Teaching has taken up a lot of my time, since my last entry I've been to Camberley, Meon Valley, Chelmsford, Cheshire, Hertfordshire and Cullen in Scotland and all places in between. Besides the teaching I've sold three pieces of work one of which was a commission. The piece left was exhibited at an exhibition with my husband who is a painter, in a gallery in Bury St Edmunds, and was bought later - before being exhibited at the Festival of Quilts. 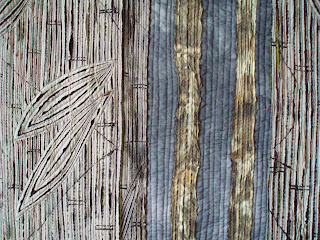 We've been to Beth Chatto's garden in Essex several times and the Bamboo is wonderful, I like the noise it makes when the wind blows through, and I'm exploring textile ideas from the photos I took. Another bamboo piece I've made uses more traditional techniques and was also in the show, it's more colourful in greens, yellows and blues and is currently in an exhibition at Sutton Hoo, Suffolk.